If you follow my Facebook page, you've probably already heard this story - feel free to scroll on down the page!!! If you missed it, I have to share my latest "misadventure" with you! Many of you "know" my little 8 pound bundle of energy, Lola. Well, Sunday night my hubby and I were playing with her, trying to tire her out before bedtime. I got a little too rowdy with her and she snipped at me - I think one of those sharp little teeth sort of "snagged" on the crease at the base of my finger. She yanked back and so did I and the two of us managed to mangle my right, index finger - YES - my crafting hand! Off to the ER at 10:00 that night - 2 hours, 4 stitches, tetanus shot and prescription for antibiotics - then finally home! All this on my hubby's birthday! This week's challenge at Peachy Keen Stamps is "Cards Only -Shape It Up". * The ornament shape is from the Silhouette Online Store. I used the Offset function to create a shadow, duplicated and flipped it. Then I welded the 2 shapes together to make a card base. 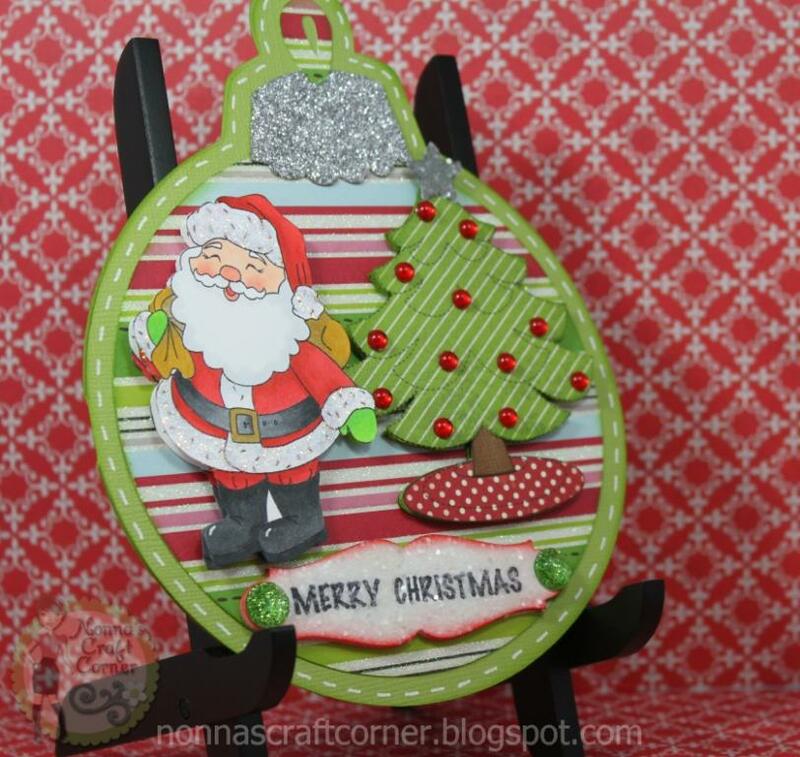 * Sentiment mat is Spellbinders die "Grommet Tags"
* This card got lots of glitter and bling! * I also used lots of pop dots to make my little Christmas scene stand out! Ok, this hen pecking is getting to me! Thanks for letting me share my sad story with you! Oh, by the way, we are thinking of changing Lola's name to Spike...whatcha think? Total cuteness, Tanya! 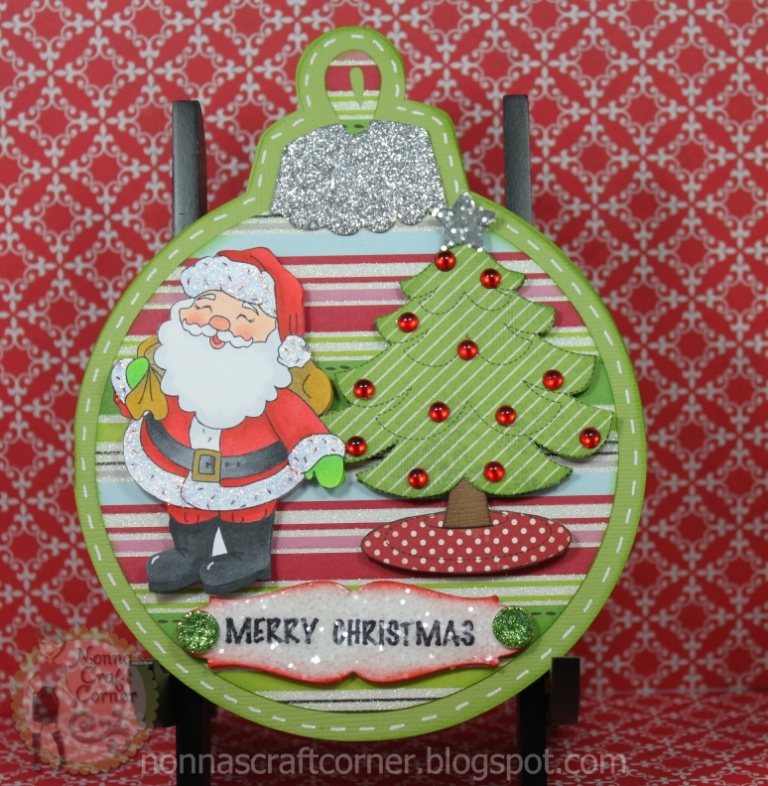 Your Santa ornament card is wonderful! I'm so sorry about your finger. I have a little Yorkie-Poo named Lola, but thankfully, she's never gotten as close as your Lola did to your finger. Hope you make a speedy and complete recovery! This is too cute! Love the cuts used! Too precious. Thanks for joining us at DCD. This is a darling card, love the Christmas of it all. Sorry to hear about your bite. BTW~ so sorry to hear about your finger :( hope the road to recovery is a fast one!! Tanya - I'm so sorry to read about your Spike (Lola) bite!! How nasty for you! I do hope it heals quickly. Your card is amazing! I love the glitter and the details are all so wonderful! You are incredibly talented to be able to create such amazing work with limited use of a hand!! Oh, not fun!! Sorry to hear about your finger!!! Take it easy and let it heal! This is really cute!! I love the shape!! How cute! Love that Christmas tree! Great job on everything! Hope you're healed up real soon. This is just so Awesomely Perfect. I just LOVE LOVE this. 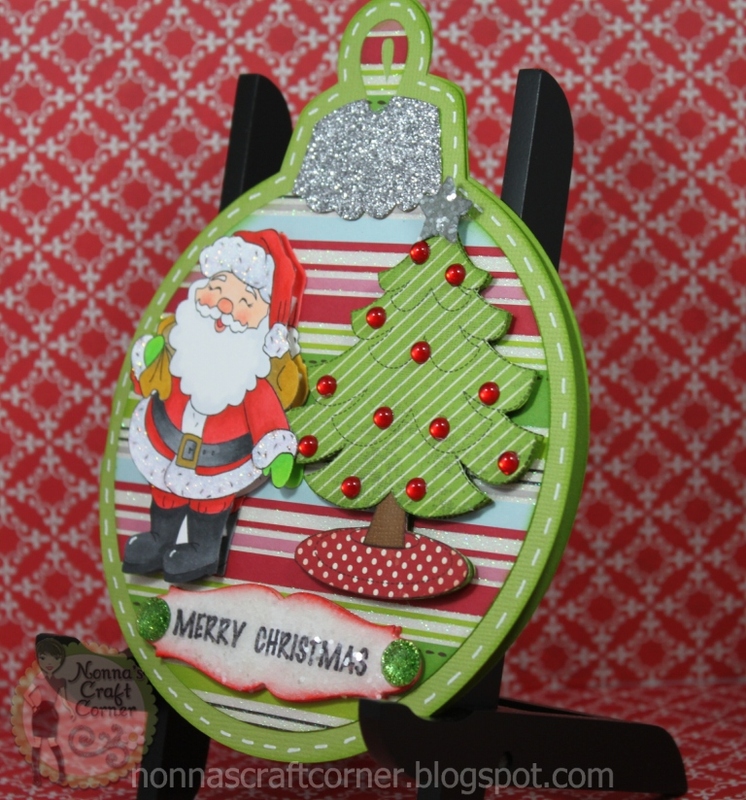 Awesome coloring and love your shaped card. I saw your finger :( I hope it gets better soon. Tanya ~ First of all your card is AMAZING!! I LOVE the shape you chose and oh my the details!! Seriously the coloring , the paper, the dimension ~ LVOE this too! I know i sound like a broken record but I can't help myself ~ I adore your creations! Okay as for your finger ~ I thought I saw that somewhere! Oh my you poor thing!! I hope it heals fast for so many reasons! I am sure Lola felt horrible doing it and your reaction! Plus on your hubs birthday no less! Hang in there and don't worry about commenting ~ LET that finger heal properly or we won;t see your AMAZING creations! note I type with barely 2 fingers on a good day! LOL! I wish I was kidding! Beautiful card. Love all the details! Hope your finger heals soon. LOVE your super cute ornament! The cuts are so fun and just festive! Another awesome project Tonya! Take care of yourself....hope it heals fast:) hugs! Wow, this card is super CUTE and the images are awesome! Great job Tanya! I hope you heal quickly and aren't in any pain!!! Thanks so much for taking the time to share your cute ornament card (especially with your hurt finger)! Hope your finger heals quickly and completely. I love your card. Such a cute Santa image. Love all your details. Happy healing! This is beautiful! Gorgeous shaped card!!! And hope your hand heals fast! That's no fun at all!!! So glad you joined us at Peachy Keen this week though!!! the coloring on this project is gorgeous. I hope you also feel better soon.